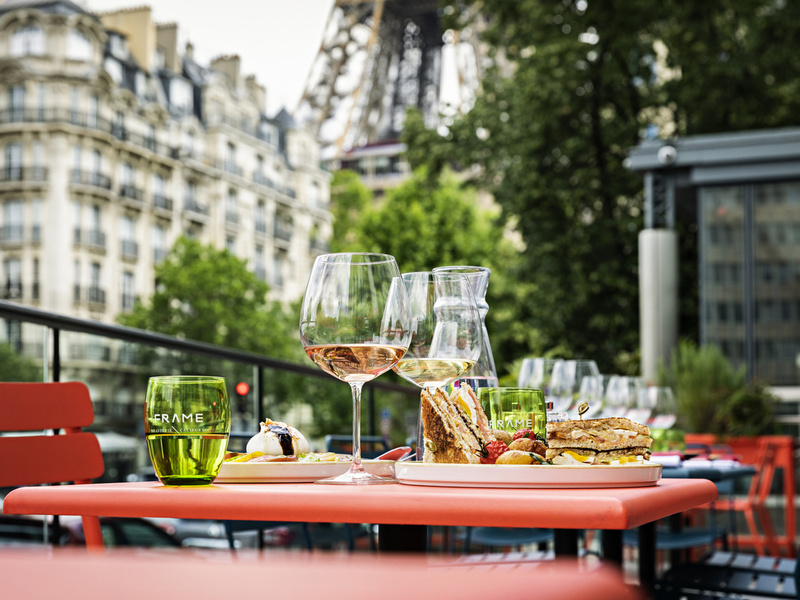 Our hotel offers comfort, simplicity and elegance at the foot of the Eiffel Tower. You can celebrate your personal and professional events in style, thanks to a dedicated and mindful team. FR\AME, brasserie in street art colours with inventive menu on fresh produce, partly from organic vegetable garden, beehives and hotel's hen house. Recipes from France, California and Mexico combine with spicy accents in a kitchen open from 10:00 am to 1:00 am. Our bar allows you to organize weekly after-work friendly or professional meetings, Sunday brunches, and other events hosted by trendy DJs. For your convenience, the hotel is fully equipped with WIFI and there is a connectivity lounge for you to use. Welcomers will be your point of contact throughout your stay with us. Probably I was having too high expectations on this hotel which located right next to the Eiffel Tower, but after staying there for 5 nights, I actually felt disappointed and not sure whether I will return nor recommend to friends at all. My experience in the Pullman was subpar due to the really poor service. When you pay over 330 Euro a night you expect a certain service level and the real life scenario was not even close. a few examples: Room service breakfast was more then 50 minutes late and required 3 distinct calls to be delivered, Shower gel was not in the room and although I requested additional soaps it got in only after 2 days and 3 calls, the gym's floor was not clean and there were no available water bottles (both fridges were empty) - really?, I can go on... bottom line, for someone who travels a lot WW, the service experience was really poor. Amazing Experience, I would go back! Very comfortable, great location and amazing staff. Enjoyed staying the the Pullman ParisTour Eiffell. I hope we can return someday very soon. Problem with the heating in the room - too hot; it was 25-26 °C. asked 2 times to get it adjusted but it was not done. The door of the WC and bathroom made a lot of noise when closing; again nothing done. Absolutely amazing hotel and good location! Reserved Eiffel Tower Balcony Room. Room was spacious and amenities inside were superb. Nespresso machine, soft robes and slippers, and free movies all contributed to a perfect stay. Breakfast was also amazing. Omelettes, every type of juice imaginable, and insane assortment of bread. great location and staff was good and room was nice. It was fine. I have stayed before and like the location and the style of the property. I had an amazing stay at the Pullman. You are within 100 meters of the Eiffel Tower. The view from the room’s balcony was breathtaking. The location was perfect with the RER (Champ de Mars) and Metro (Bir-Hakeim) both being in short walking distance. I have and will recommend staying here. Clean, compact and comfortable room. Checking out process by using partially the hotl points were well taken care of. Nice to receive a complimentary drink. The hotel didn't smell very good and the rooms are extremely hot. Staff isn't always the most helpful and didn't follow through when promised. Hi, I love the Pullman but my last stay was miserable due to the terrible Wifi connection: very slow and disconnecting all the time. I chose Pullman to have a nice big room with a desk so I can work in the evening, but I cannot do that when the wifi is so poor. I had a lot of work to go through, and as a result of the low wifi quality I had to stay up very late on both night, loosing time and getting little sleep. From the location, rooms, up to the great staff, this hotel has really impressed us in every aspect possible. This hotel has truly given us the “wow” effect. Check-In was fast and easy. Our room was truly stunning. Incredible beds and gorgeous bathroom even with a rain shower! The view to the Eiffel Tower, especially at night, was the most amazing addition for such a beautiful room. Received a thoughtful surprise for our honeymoon trip with balloons and decorations. Room service was good but our orders were messed up a little, some food that we ordered was not included when they sent over to our room. Lovely hotel. Clean. Nice service. Everything was great besides not being able to turn on the ac when it was hot. Nice hotel & good location on the East side of the river! Nice room, adequate bath, and good hearty breakfast each morning!